Master Qui-Gon Jinn was alone right after his wife died on the mission. Obi-wan Kenobi was young and still his padawan back then. Qui-Gon, was holding his daughter in his arms and Obi-wan was watching his own Master holding the baby. Obi-wan was worried that he wouldn't have time to be with his Master anymore, because of his daughter. Qui-Gon loves his daughter alot, and he would do anything to protect her from the sith. Obi-wan "How, long are you going to hold her Master?" he said. Qui-Gon "Obi-wan, I think it's time for you to understand, that I have to take care for my daughter." he said. Obi-wan "Master, but I got a feeling she is just going to take too much time of you're time." he said. Qui-Gon "You have to understand Obi-wan, that I have a child to raise now. You must help me." Obi-wan "How much work, is it to raise a baby?." he said. Qui-Gon "Alot of work, to take care of a child." he said. Obi-wan "What about the mission's?." he said. Qui-Gon "I'll have to take her on our mission's Obi-wan." he said happly. Obi-wan looking at him "Master, we can't take you're daughter with us." he said. Qui-Gon "Obi-wan, when Monica get's older she can come with us on mission's no matter what. I can promise you that much"
Obi-wan "But---. " he said. Qui-Gon "There's no buts, Obi-wan. I know she just a baby now. But she will get older and powerful, like her mother" he said. Obi-wan "I understand." he said. Qui-Gon holding his daughter "You ready to hold her?" he said. Obi-wan holding his arms out to Qui-Gon "Yes, I am Master." he said. Qui-Gon giving Obi-wan the baby "Just hold the head and she will be find." he said. Obi-wan looking at her while holding her "She is beauitful Master. I think I love her. She will become a beauitful woman." he said smiling to Qui-Gon. Qui-Gon placing his hand on Obi-wan's sholder " I know she will Obi-wan. I know she will." he said. Monica-Gon Jinn was 19 years old. Back then Obi-wan and Monica, was always playing outside of Coursant where the grasses, trees and all beautiful things. Obi-wan and Monica were always playing tag and hide & seek. Qui-Gon, would stand there just watching them two to get along. The day was back then Qui-Gon Jinn got a call from the Jedi Council on his comlink. A mission to Naboo that had came up. Obi-wan and Qui-Gon had to go. Monica had to stay with someone. Qui-Gon Jinn, didn't really trust anyone to watch his daughter because, he was afriad that she would be hurt, be killed, be kidnapeped, and so other things that Qui-Gon don't want to think of. So, he asked his very close friend named Master Plo Koon to watch her. Master Plo Koon was the only person that knew that Qui-Gon was married and had a daughter. Master Plo Koon came in that day and sat down next to Obi-wan Kenobi. Master Plo Koon (bowing) "Master Qui-Gon Jinn, I would be very awarded to look over you're daughter for you." he said. Qui-Gon "Thank you. Obi-wan and I have to go on this mission. This mission is very importnat to us and for me to serve the Jedi." He said. Master Plo Koon "I understand Qui-Gon. Anything you like to go over to tell me, what to do?" he said. Qui-Gon "Well, make sure she doesn't get tinto trouble." he said. Master Plo Koon " You have a lot of standyards with you're daughter." he said. Qui-Gon "Of course I do." he said. Master Plo Koon "So, you going to tell her about the mission? Or not?" he said. Qui-Gon "Yes, I have too. Right now I am. Monica?" he said. Monica walked in 'Yes, father." he said. Qui-Gon looking at her "I am not going to be here with you today. Obi-wan and I have to go on this mission. You are to stay with Master Plo Koon for a while." he said saddly. Monica "I know you have to go on this mission. I am not worried you're going away. I am just happy that you are serving the replic. That's you're job." she said. Qui-Gon smiling and placing his hand on her sholder "Of course it's my job. I am gald you are taking this as a young woman." he said. Monica bowing " Thank you father." looks at Master Plo Koon " I am gald you are here." she said. Master Plo Koon bowing back "Thank You." looking at Obi-wan "I---am very happy that you have a friend like her" he said smiling. Obi-wan " Monica, I'll will miss you. I hope we come back in one peace." he said smiling. Monica "I know you will Obi-wan." she said siling back at him. Qui-Gon "Monica, you will be allright with Master Plo?" he said. Monica " I'll be fine." she said. This is the last chapater for this little story.You know what happened to Qui-Gon Jinn. You know what happen's to Obi-wan and Monica. So, I'll just jump to this chapater where Obi-wan, comes home to tell's Monica that Qui-Gon Jinn had been passed on. Monica-Gon Jinn was sitting at home and waiting for Qui-Gon to return with Obi-wan, but only Obi-wan came back and not Qui-Gon. Monica asked about him, but he was not happy at all. Obi-wan, was sad and upset. Monica "Where is Qui-Gon?" she said happly. Obi-wan shakes his head "Qui-Gon,Qui-Gon, I am sorry Monica, but Qui-Gon has passed away this afternoon after Darth Maul killed him. Qui-Gon told me that he loved you and he'll watch over you above. He also told me that I have to train Anakin Skywalker." he said. Monica looked at Obi-wan in small tears "Obi-wan, I know that it was Qui-Gon's time to go. But, I never got a chance to say "Goodbye" to him. Now, he'll never know that I had feelings for you Obi-wan. I love you Obi-wan. (kisses him on the lips) I tell him everything, even when I am upset about things like this." she said sadly. Obi-wan smiled with tears "I know, you told him everything. I think he knew you, had feelings for me. Monica, you were the only girl I liked even, when you were a baby. I even held you in my arms for a while and a bit longer. I love you too Monica (kisses her and holding her hands) You and I meant for each other. Qui-Gon, would want you to be happy and move on in life." he said. Monica looks into his eyes "Obi-wan, how can I say "Goodbye" to him? How can I tell him I loved you?" she said. Obi-wan looks into her eyes "You, can say "Goodbye" just say it into the force to tell him. Tell him that you had deep feelings for me. He would be smiling at you above you. Trust me, he will answer you." he said. Monica "Obi-wan, I will have to take time to talk though my mind to get to him." she said. Obi-wan "Take you're time." he said. Monica walks into a room and sitting quitely "Qui-Gon, it's me you're daughter Monica" she said to the force. Qui-Gon's Ghost appears "Monica, I knew it was you." he said. Monica looks up " Qui-Gon?" she said surprised. Qui-Gon's ghost "I know, you have alot to say. But, I am here. You look worried my dear. What's on you're mind?." he said. Monica "Well-----I just want to say 'I miss you'. " she said. Qui-Gon's ghost "I miss you too." he said. Monica "There is something else-----" she said. Qui-Gon's ghost "Yes" he said. 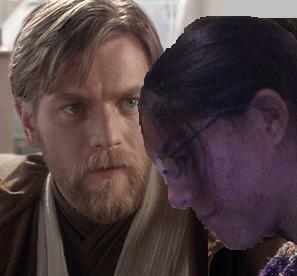 Monica "I am in love with Obi-wan Kenobi" she said happy. Qui-Gon's ghost "I know you are." he said. Monica "You're not mad?." she said. Qui-Gon's ghost "Mad? Not at all." he said. Monica "Well, Obi-wan told me that I had great feelings for him." she said. Qui-Gon's ghost "I know you did." looks at her one last time "I can't stay that long. Monica, you and Obi-wan will be happy togther in future time." he said leaving the room. Monica looking around the room "I, know we will be togther in the future." she said smiling to herself. LIKE QUI-GON SAID "MAY THE FORCE BE WITH YOU"